Magerealm is ready to start 2016 strong with a new update featuring a ton of new content! Here’s a sneak peak at what players can look forward to later this month! The current Ladder system has been greatly improved and expanded with the addition of the much awaited Cross-Server functionality. Test yourself against the the best the world has to offer, and see who can claim to be the best warrior in Magerealm! Strengthen your resolve and prepare for some next-level competition. Details about Cross-Server Ladder will be released shortly, so please stay tuned. 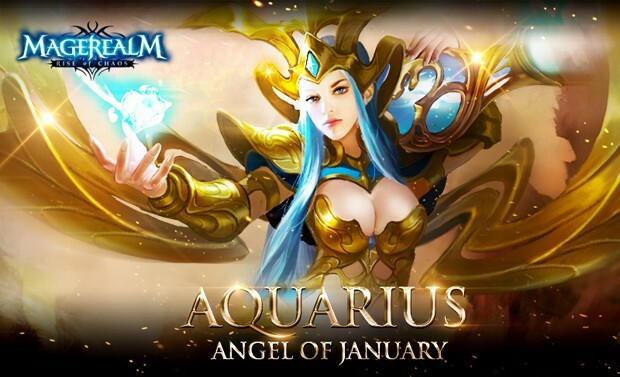 Aquarius, the Angel of January, will be the next Angel to answer the Mage Council’s call to arms. With her unfathomable powers over the oceans themselves, Aquarius can summon an endless surge of water from her mystical urn. With a mere flick of her wrist, she can call forth tsunamis and whirlpools to wash away enemies. A new Hero is about to make a splash in Magerealm! From the vast oceans emerges Tide Weaver, a strange dweller of the sea with a child-like curiosity. But don’t be fooled by his playful nature! Having wrestled with all sorts of deadly sea creatures, his combat ability is not to be underestimated. Tide Weaver’s quest to see the surface world has led him to join the Mages in the battle against evil. Additional content in this update include new Pirate-themed fashion for those who love the open seas and Crimson Fang, a ferocious lion that will have your enemies fleeing in terror as you ride into battle. January is going to be an exciting month for Magerealm players! More details regarding the update will be avaliable soon. Follow Magerealm on Facebook and visit the official site and forums to get the latest news and participate in rewarding events!